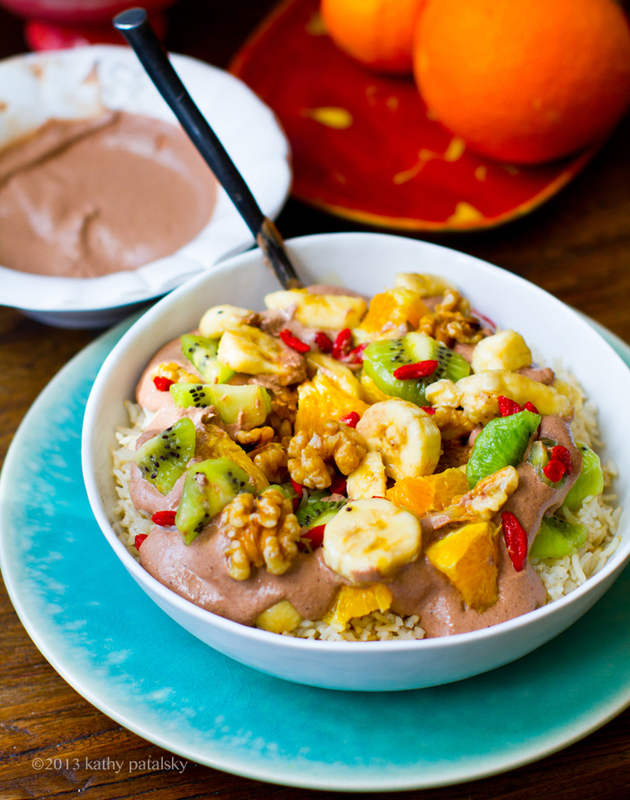 Superfood Bliss Bowl: Fresh Fruit, Cacao Cream, Warm Brown Rice. 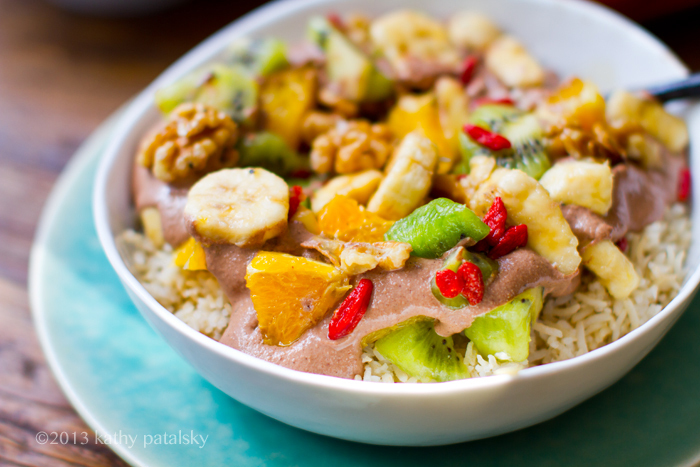 So my salad turned into a Super Fruit & Cacao Rice Bowl. The cacao cream/puree/pudding in this dish could easily be served all on its own for dessert of breakfast. 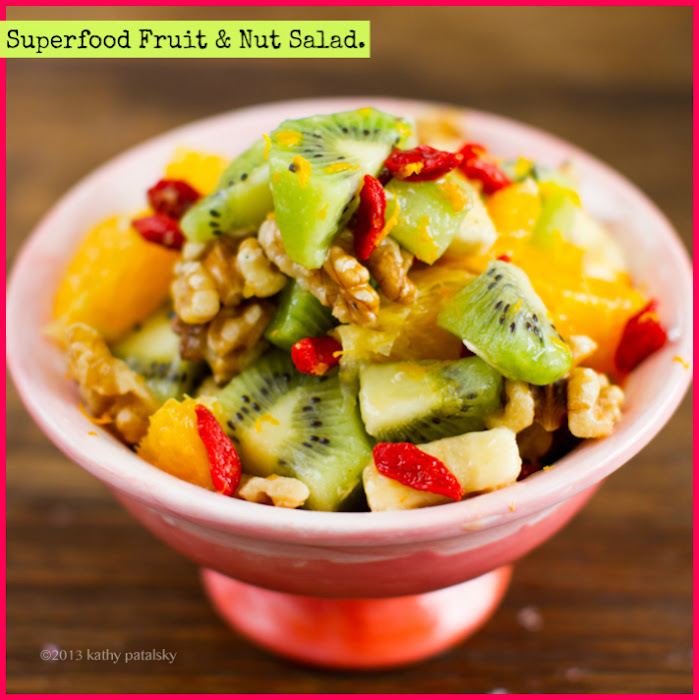 This nutty and somewhat unusual dish is pretty fantastic if you like to get creative with your wellness meals. 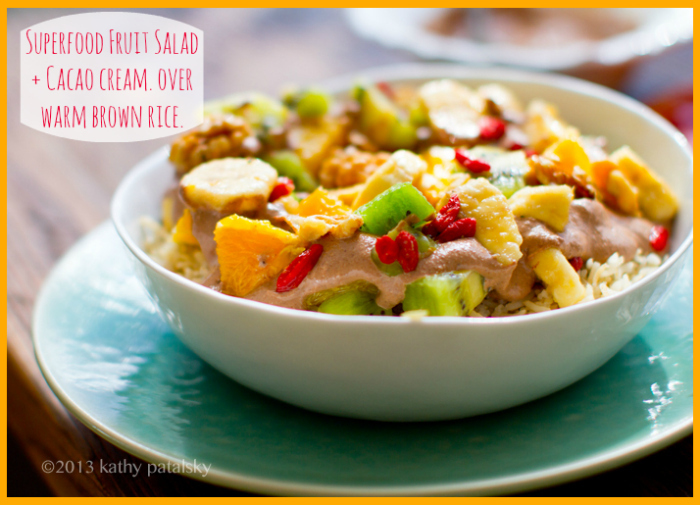 So start with the fruit salad recipe and add some fun, if you'd like. Click ahead to see how it all turned out!.. 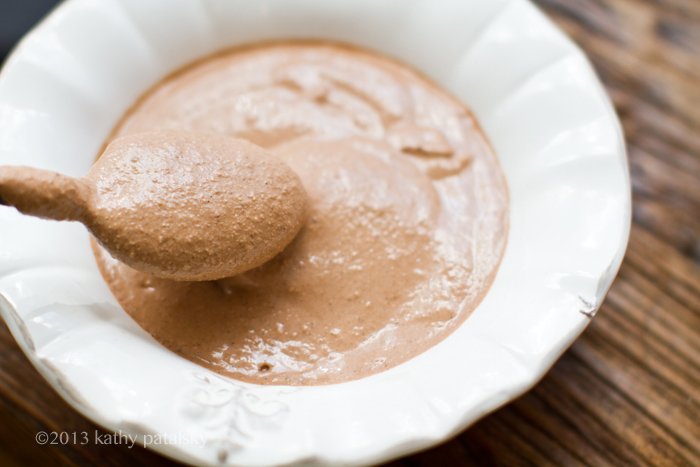 Cacao powder and nibs were crushed with walnuts and cashews in my Vitamix to create a super creamy puree that resembled a chocolate pudding of sorts. You can sweeten and salt to taste. I only added a tiny splash of sweetener since the fruit was sweet enough on its own. Cacao is rich in free radical fighting antioxidants! And this healthy dish is a super way to satisfy a chocolate craving (and feel REALLY good about it). 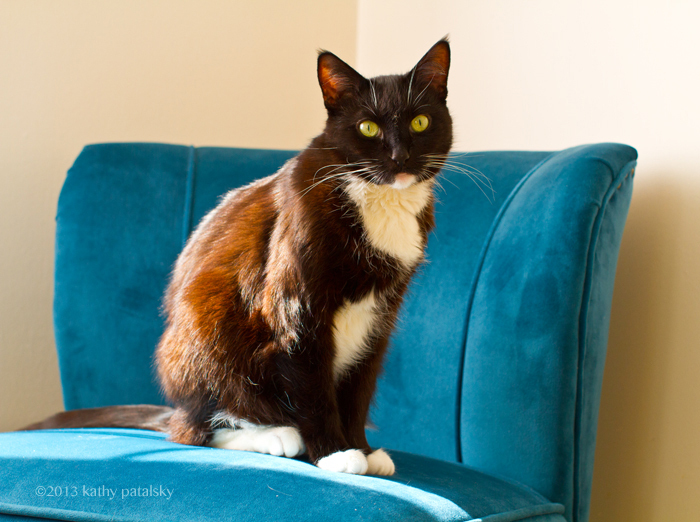 It is amazing what a little chocolate can do. 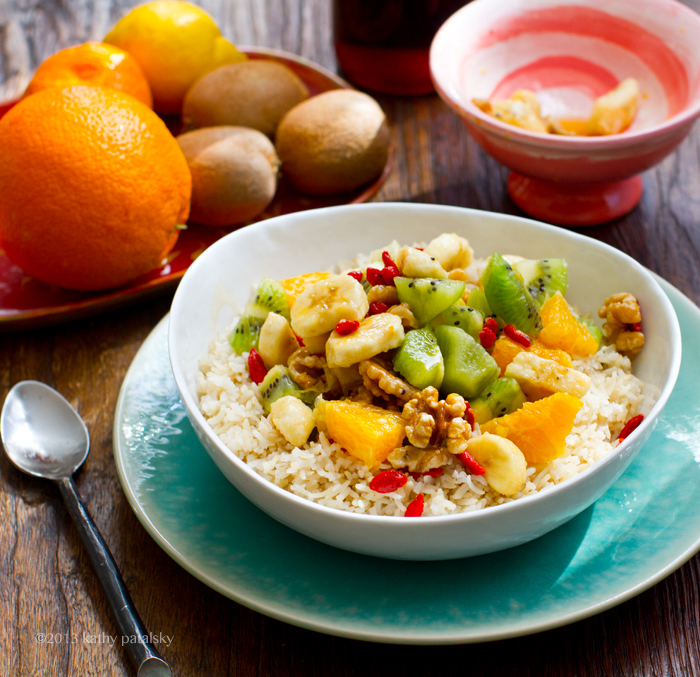 From rice bowl with fruit.. 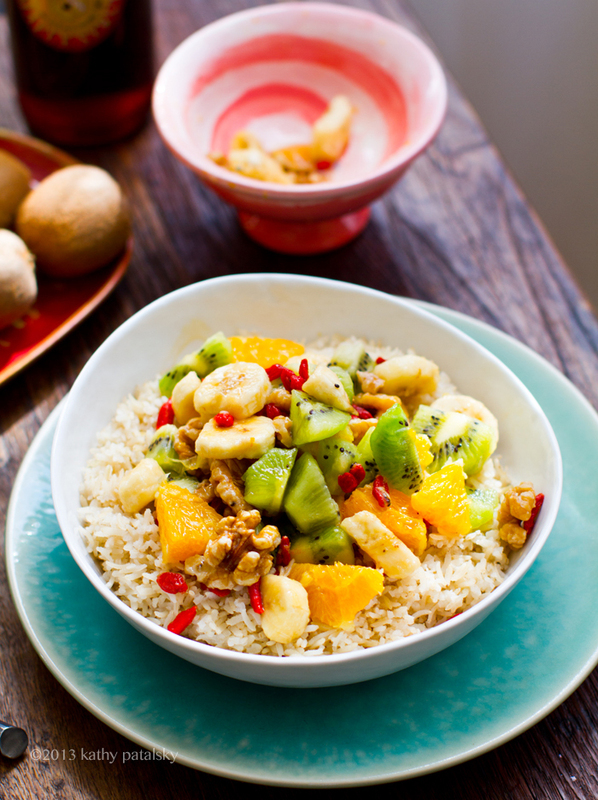 So even though it looks NEW and unusual - give this super food meal a try! Rice. I just used basic just-cooked brown rice. Rice pudding or non-dairy milk simmered rice works too. 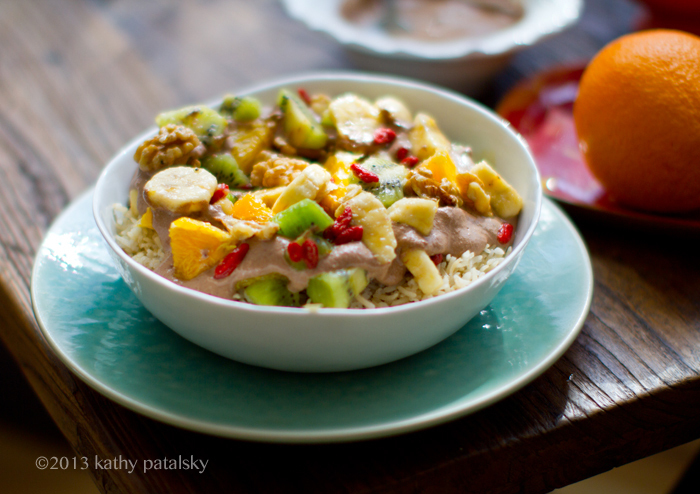 Super Food Fruit Salad + Cacao Puree. Over Warm Brown Rice. 1. 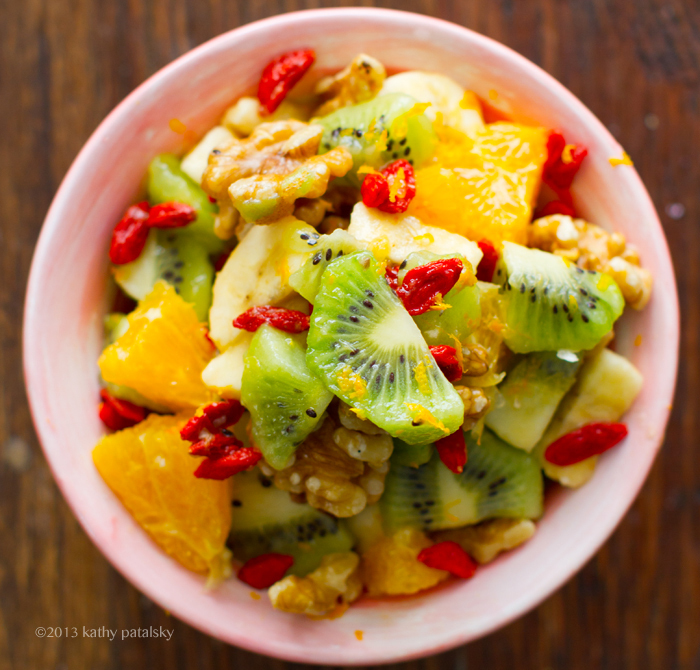 Prep your fruit salad fruit. 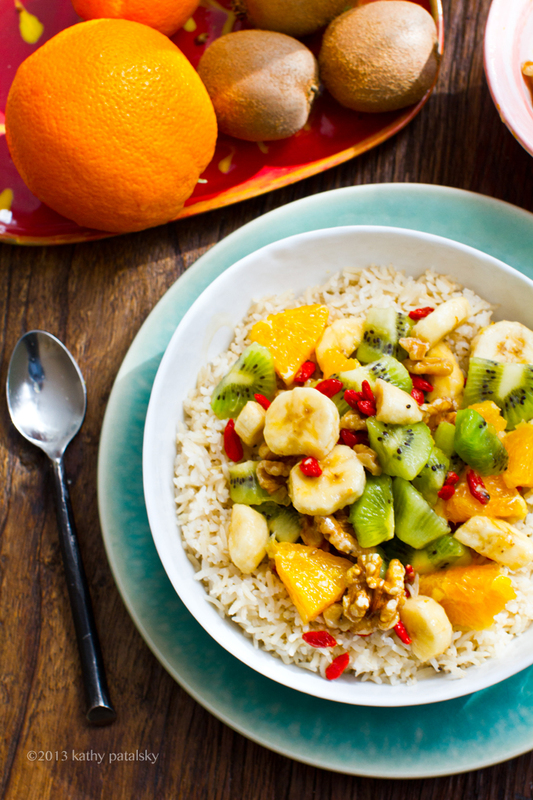 Add chopped fruit to a large mixing bowl. Toss well with all ingredients and place in the fridge. 2. 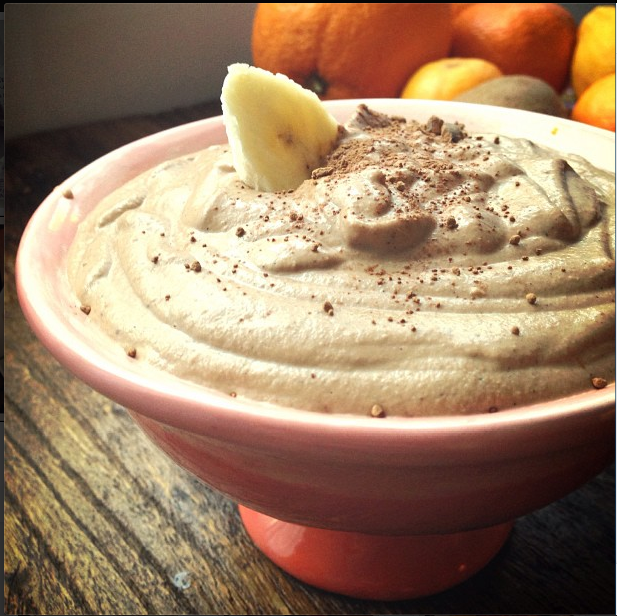 Add all the cacao puree ingredients to a high speed blender (like a Vitamix) and start blending from low to high. Note: start out with just 1/3 cup cashews and add in up to 1/2 cup if you want a thicker puree. Blending on HIGH is the best way to fully pulverize your nuts and thicken your puree. Sweeten and salt and add cacao to taste. Place this puree in the fridge to chill for a few minutes or overnight before serving over top warm rice. 3. Warm pre-cooked rice, or boil and cook rice as directed on package. You can either sweeten and soften with some non-dairy milk or just serve a more dry cooked rice. Up to you. 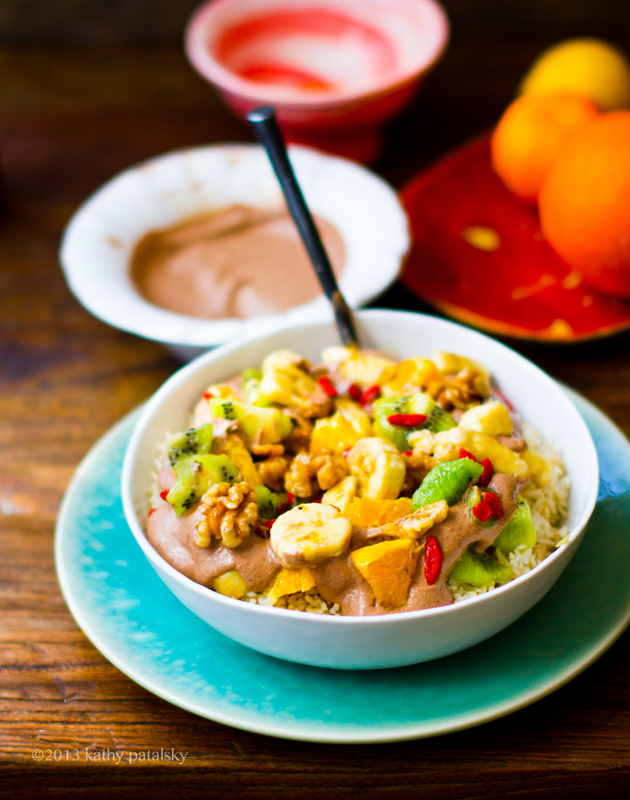 You could also substitute oats, quinoa, farro, cream of rice and more. 4. Serve! 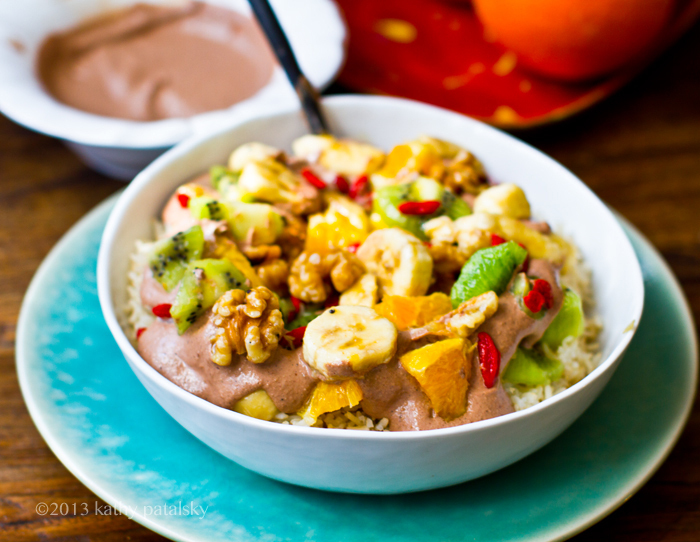 Add the grain base (warm rice) and top with the cacao puree and as much fruit salad as you'd like. Optional: Add chia seeds, mint and/or cacao nibs over top if desired! 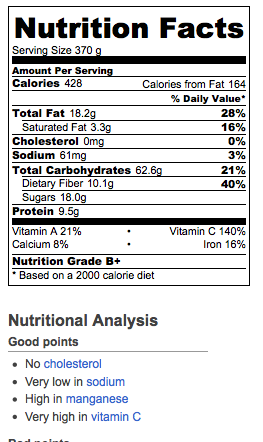 Nutrition estimate (per serving, 3 servings per recipe) - big bowl!